This post summarizes the new features introduced with CEP4. Details on each feature will follow – one post at a time. I’ll try to do posts less dependent on screen captures first. One of the most useful new features. Solves the problems when using CEP3 of having to reopen CEP each time a new filter is applied. 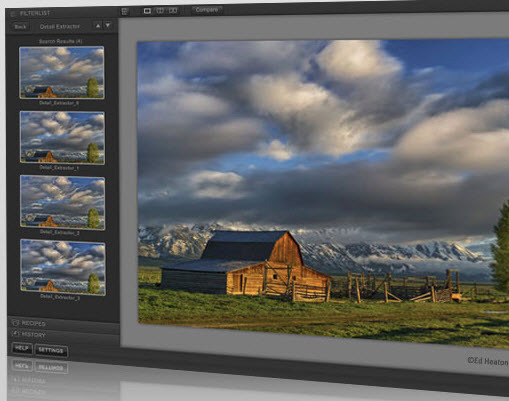 The ability to adjust Opacity from within CEP, without waiting until returning to PS’s layers, is a big plus – especially since it can be adjusted on a filter by filter basis. Of course, selective adjustments has always been there via Nik U-Point control points. More to come in later details posts. What’s not mentioned is the CEP3 filters that were eliminated – Burnt Sienna, Detail Stylizer, Saturation Stylizer, Infrared Thermal, Flux. No loss IMO; in fact they should have dropped a few more as the menu is getting crowded with filters that are probably rarely or never used. Some useful changes were made to several filters. For example, Brilliance/Warmth has a new control, Perceptual Saturation. I’ll discuss this (vs the Saturation slider – still there & called Brilliance in CEP3) in a later post. Very useful – providing you understand the difference between Saturation & Perceptual Saturation (I’ll explain). 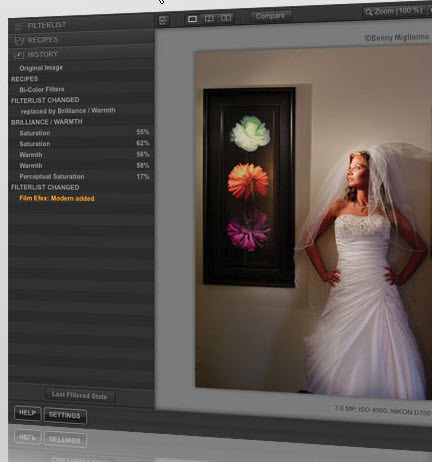 Not all filters have new controls – just a few in fact – but the algorithm changes “under the sheets” made throughout make for faster, more responsive software. Very useful as shown here. A visual illustration of possible filter outcomes – use as is or as a starting point for your own refinements. No need to reinvent the wheel every time you use CEP – super-useful! Basically the same as the SEP2 version. Nik’s History Browser is explained this post of mine. This entry was posted in Post-Processing and tagged Art Photography, Color Efex Pro, Color Efex Pro 4, Nik Software, Photography How To, Photography Tips, Photography Tutorial, Photoshop, Post processing by Ed Knepley. Bookmark the permalink.